In New Port Richey Medical Investors, LLC v. Stern ex rel Petscher, 14 So. 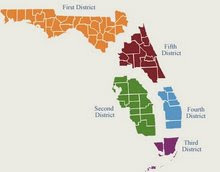 3d 1084 (Fla. 2d DCA 2009), the Second District reversed the circuit court's order finding an arbitration clause invalid. The court held "the parties' arbitration agreement is not rendered invalid or unenforceable simply because the AAA is unavailable to conduct the arbitration. Instead, the circuit court must appoint another arbitrator or arbitrators."